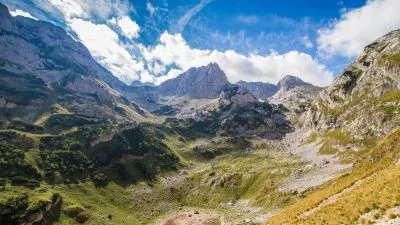 Our self guided walking holidays in Albania offer some truly breathtaking scenery and a chance to experience the best of European hiking as it used to be through some of the last untamed natural locations and wilderness in Europe. Albania is one of the few countries in Europe which still excites as an exotic destination. Nearly untouched by Western civilization, the country is rich in traditions and culture, and has a lot to offer to walkers. Exploring Albania with a self guided walking holiday will give you a chance to experience local people’s hospitality and enjoy spectacular scenery. The lower prices compared to other European countries are only a bonus to what will certainly be an epic holiday! We take pride in hand-picking the hotels we offer on each of our holidays and Albania is no exception. We’re probably the only company which offers private rooms on most nights while hiking in Albania. Each hotel and guesthouse we’re offering is monitored by a representative of our company to ensure you’ll make the most of your holiday. 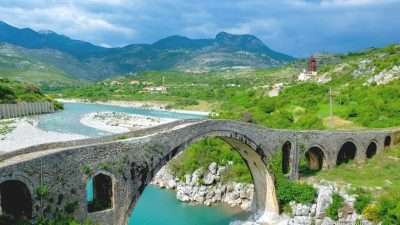 Where Do our Walking Holidays in Albania Take Place? 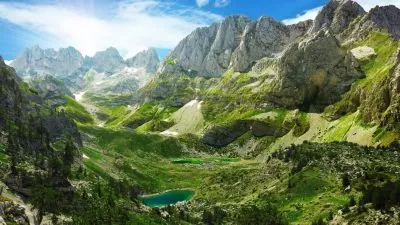 Prokletije, also known as the Albanian Alps and the Accursed Mountains, is a mountain range, extending from northern Albania to Kosovo and eastern Montenegro. Its peak in Albania, Maja Jezercë at 2,694 m is the highest point, and the second highest peak in Albania and the highest in the entire Dinaric Alps. Both the highest peak in Montenegro, Zla Kolata at 2,534 m (which is also partially in Albania) and the highest in Kosovo, Gjeravica at 2,656 m, are here. The highest peak in Albania, however, is Mount Korab, part of the Korab range, 2,764 m high in the east of the country on the border with the Republic of Macedonia (making it Macedonia’s highest point in addition). The southernmost glaciers in Europe were recently discovered in the Albanian part of the range. 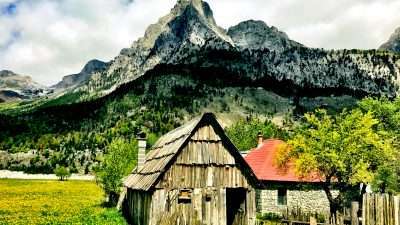 The Albanian Alps are one of Europe’s hidden gems and offer a unique hideaway from the modern world. The Southern Mountain Range (Albanian: Krahina Malore Jugore) is defined by high mountains and few valleys and plains between them. The range notably includes two mountain chains: the Trebeshinë-Dhëmbel-Nemërçkë and Shëndelli-Lunxhëri-Bureto. It also includes the Tomorr in its northern part, the Mount Çika and the Ceraunian Mountains in the west, two mountains which are close to the Llogara National Park. The mountainous region of Kurvelesh is part of the range, while its coastal region is part of the Albanian riviera. Nemërçkë is a short mountain range on the border between Albania and Greece, which extends from the north-west to the south-east. To the north Nemërçkë is separated from the Albanian Pindus mountains, by the Vjosë river, Albania’s second longest river, while to the south it reaches the Albanian-Greek border. 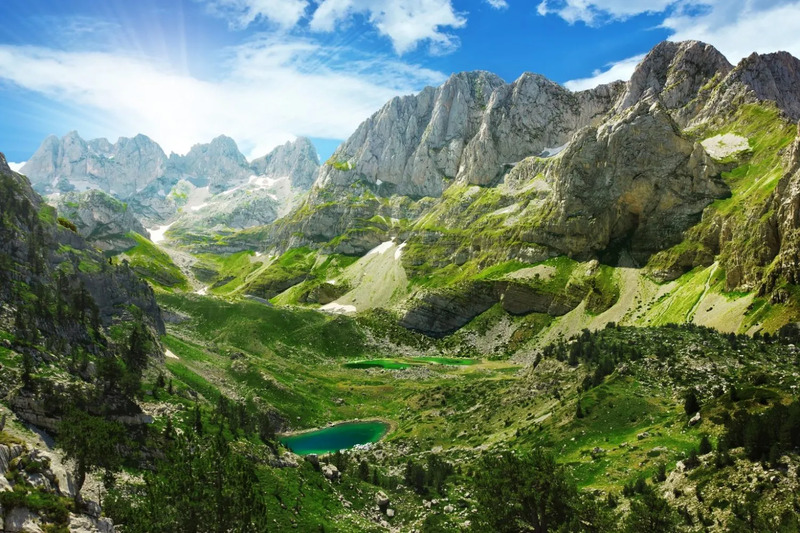 The Albanian Alps are one of Europe’s hidden gems and offer a unique hideaway from the modern world. An additional bonus is the chance to experience the legendary hospitality of the famous Malësori (highlanders) – a mountain community unlike any other you’ve ever heard of. According to Adam Graham from BBC travel this hospitality was the reason a Valbonë villager gave him a ride at 1:30am, chuckling when he realized that Adam managed to get lost in a village with only one road. The Albanian Kanun has sparked the interest of many writers and movie producers around the world. It is even referred to in an episode of Law & Order, as well as hundreds of other movies and books. Locals often refer to the Albanian Alps as the “Accursed” mountains. The legend tells of two brothers who went hunting in the mountains and found a nymph. When they asked her which one of them she chooses, she replied that she likes the one for his bravery and the other one for his looks. The brave brother then murdered his better looking sibling and took the nymph home. When his mother realized what happened she cursed the nymph, her son, and the mountains for ever. Another legend tells the story of a mother, who cursed the mountains after her son (a shepherd) never returned. According to linguists, however, the nickname of the “accursed”mountain may originate from a linguistic hiccup. The Albanian word “nam” means “to curse” but it also refers to something large and renowned. This could perhaps better explain the translation Accursed mountains from the Albanian expression “Bjeshkët e Namuna“.